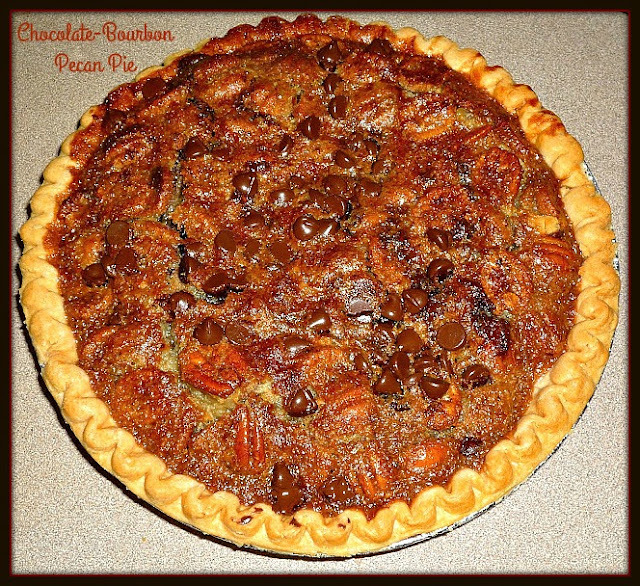 April 14th is National Pecan Day, and I want to celebrate by sharing one of my favorite pie recipes with you. Pecans are a popular staple ingredient here here in the South...we often use them in savory and sweet dishes. 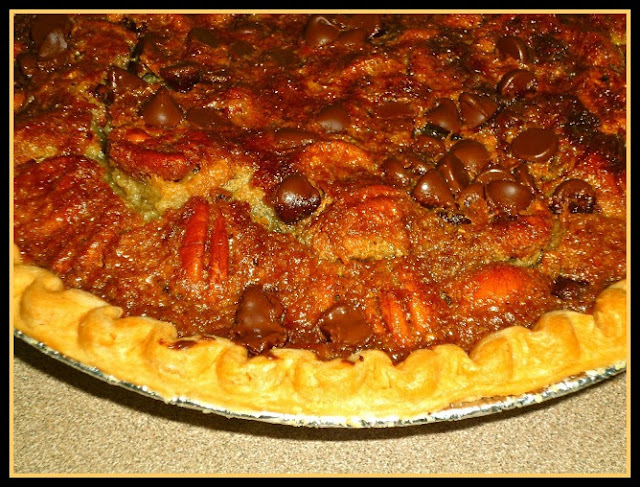 My Chocolate-Bourbon Pecan Pie recipe combines the goodness of sticky-sweet pecan pie with decadent melted chocolate chips and a shot of bourbon. It's a decadent treat, but it's really simple to make. If you love making pie crust, by all means use your favorite recipe. If you're like me and making scratch pie crust makes you twitchy, do what I did: buy a good-quality frozen pie crust. Step 1: Preheat oven to 350. Combine the eggs, light corn syrup, melted butter, sugar, dark brown sugar, bourbon, flour, vanilla, and salt in a large mixing bowl. Whisk together to completely combine. Stir in the pecan halves and the 1 cup of semisweet chocolate chips. Step 2: Carefully pour the filling into the pie crust. Sprinkle the additional 1/2 cup semi-sweet chocolate chips on top of the pie. Place the pie on a baking sheet in case you have some bubble-over. Bake for 50-55 minutes, or until set. If you notice your crust is browning too quickly, place strips of foil over the edge of the crust to prevent it from overbrowning. I did this about 4o minutes into the baking, and my crust turned out perfectly golden. Cool the pie completely before slicing. See how pretty it is? Step 3: When you're ready to serve the pie, wet a sharp serrated knife and cut into six wedges. The filling is pretty sticky, so it can be hard to get pretty edges. As you can see, it was tricky for me, but it still tasted amazing. Top with whipped cream or serve with a scoop of vanilla ice cream. Just look at all that chocolatey pecan goodness! This decadent pie is rich and very sweet, so a little goes a long way. The combination of sweet filling, earthy pecans,and melted chocolate is simply amazing. The addition of bourbon gave the filling that "little something extra." It's not the least bit overpowering, but you definitely know that it's there. If you're feeling extra daring, feel free to up the ante by adding a tablespoon or two of bourbon to your cream before you whip it up. I hope you give this pie a try very soon, and that you love it as much as I did!